In the beginning there was a young girl who learned hymns at church, and now in the 21st century, we have Barrie Hart, who is a passionate musician and a worshipper. Hart’s love and dedication for her savior is apparent in her album titled Whom Shall I Send? Hart takes us in a spiritual, emotional journey, thinning the line of religion. Her heart-wrenching call for devotion seeps through her songs “Bread and Wine,” “Here I Am,” and “I Worship You” calls for one to reminisce amongst one self with the goodness of God. 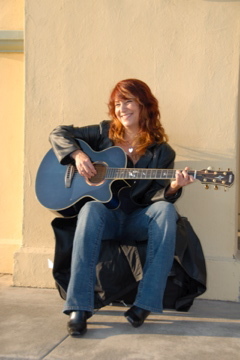 Hart’s music background reflects her variety of her songs, from joy, pain, and glory, the One will always be praised with her passionate heart. Sabrina Tinsay: Were you always a Christian artists throughout the years; if so, how did you stay strong with your belief that you would get through the perception of worship songs as something that would only be sung in a church? Barrie Hart: No. My first “professional” work was singing backup for a local blues artist, Sarah Baker. I began singing on a worship team and then leading worship in the ’90s. The team that I led got the opportunity to play at the local Farmer’s Market in San Rafael, California. We played three sets, 80% worship, with a few secular covers thrown in. It’s a big market, three stages. We held the biggest crowd. That’s when I knew. Tinsay: Do you remember your first composition? Tinsay: Where was your first performance at? Hart: My first performance ever was the Warfield Theatre in San Francisco, California singing backup for Sarah Baker. My personal first outside of church was the San Rafael Farmer’s market. Tinsay: Your album titled Whom Shall I Send? has honest lyrics; did you always write your songs this way? Hart: Yes. I don’t know any other way to write. My lyrics come from my experience…my heart…my view. I take great comfort in knowing that He “sees me as I am” and loves me. I know He loves my honesty. Tinsay: When did you learn that you were going to focus on Christian music primarily? Hart: I’ve actually done and still do both, but I’ve always known that I’m at my best when I lead worship. It is the best part of me. I believe I am first a worship leader and second a musician.